Today I'm going to tell you a little bit about a band that started out under the name "The Blue Velvets". The band was a trio of - John Fogerty, Stu Cook, and Doug Clifford. A little while later, John's older brother, Tom Fogerty joined in on vocals. Their band wasn't getting a lot of sales on their records, even though famed Casey Kasem had put their music into rotation. Changes were made within the band. Tom took up guitar, but remained lead vocalist, and Stu switched from piano to bass. The band was eventually signed by Fantasy Records. With their first release, Mark Weiss, co-owner of Fantasy Records, changed the band's name to The Golliwogs. Band roles changed again. John became the band's lead vocalist and primary songwriter, and Tom remained as backup vocalist and guitarist. the four members' renewed commitment to their band. The band starting putting out hits. Their first was a remake of a 1956 song by Dale Hawkins - "Suzy Q". A second album was put out. The single "Proud Mary", backed with "Born on the Bayou", reached No. 2 on the national Billboard chart. The former would eventually become the group's most-covered song, with some 100 cover versions by other artists to date, including a hit version in 1971 by Ike & Tina Turner. John Fogerty cites this song as being the result of high spirits on gaining his discharge from the military. The album also featured a remake of the rock & roll classic "Good Golly Miss Molly" and the band's nine-minute live-show closer, "Keep On Chooglin". More albums and hits kept churning out. In 1972, the bandmates started arguing amongst themselves, and fingers were pointed at each other about the contract that was held with Fantasy Records. On October 16, 1972—less than six months after the Mardi Gras tour ended—Fantasy Records and the band officially announced the disbanding of CCR. The band never formally reunited after the break-up, although Cook and Clifford eventually started the band Creedence Clearwater Revisited. In 1973, John Fogerty began his solo career with The Blue Ridge Rangers, his one-man band collection of country and gospel songs. Under his old CCR contract, however, Fogerty owed Fantasy eight more records. In the end, he refused to work for the label. The impasse was resolved only when Asylum Records' David Geffen bought Fogerty's contract for $1,000,000. His next major hit was "Centerfield", a chart-topping success in 1985. On tour in 1986, however, Fogerty suffered complaints over his steadfast refusal to perform CCR songs and suffered with recurring vocal problems which he blamed on having to testify in court. Fogerty's explanation for not playing CCR material songs was that he would have had to pay performance royalties to copyright holder Saul Zaentz, and that it was "too painful" to revisit the music of his past. Tom Fogerty released several solo albums, though none reached the success of CCR. Fogerty's 1974 solo album Zephyr National was the last to feature the four original CCR band members. 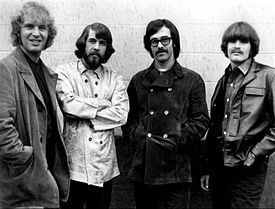 Several tracks sound very much in the CCR style, particularly the aptly titled "Joyful Resurrection" on which all four members played, even though John Fogerty recorded his part separately. Tom Fogerty died of an AIDS complication in September 1990, which he contracted via a tainted blood transfusion he received while undergoing back surgery. Tom and John never reconciled before Tom's death, and in the eulogy he delivered at Tom's funeral, John said, "We wanted to grow up and be musicians. I guess we achieved half of that, becoming rock 'n roll stars. We didn't necessarily grow up." The original CCR lineup rarely reunited after their breakup. All four members jammed together at Tom Fogerty's wedding on October 19, 1980. John Fogerty, Cook, and Clifford played at their 20th High School reunion in 1983, but as their original incarnation, The Blue Velvets. In the 1980s and 1990s, new rounds of lawsuits between the band members, as well as against their former management, deepened their animosities. By the time CCR was inducted into the Rock and Roll Hall of Fame in 1993, John Fogerty refused to perform with Cook and Clifford. The pair were barred from the stage, while Fogerty played with an all-star band that included Bruce Springsteen and Robbie Robertson. Tom Fogerty's widow Tricia had expected a Creedence reunion, and even brought the urn containing her husband's ashes to the ceremony.